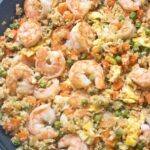 Super fast to prepare, super easy to make, and most importantly super tasty and flavorful! 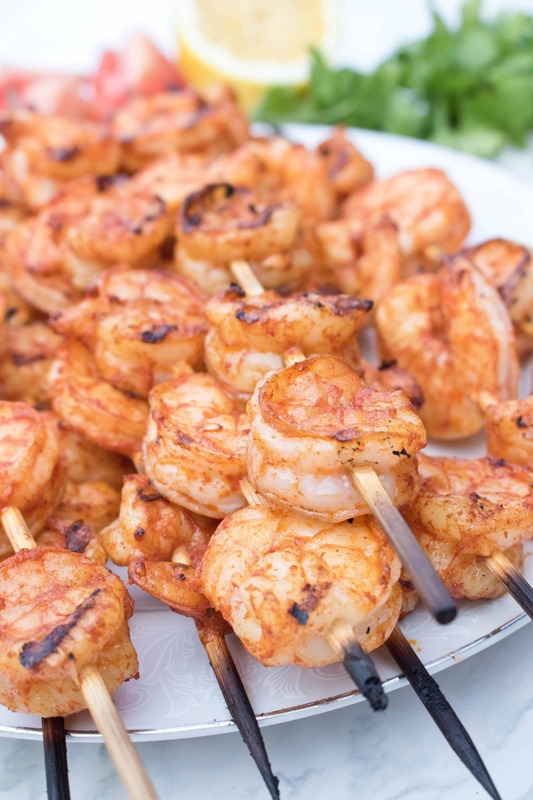 These Spicy Grilled Shrimp Skewers are perfect for your summertime grilling! Juicy. Spicy. Super flavorful. 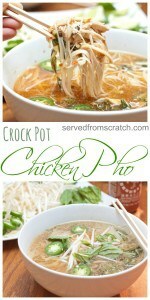 Perfect for a sunny spring/summer weeknight! We topped some fresh spinach salads with and it was near perfect. The only thing it was missing was a crisp white wine! Craving shrimp as much as I am lately? 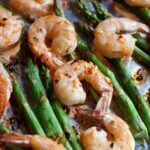 Then don’t forget to check out my Teriyaki Shrimp Salad with Sesame Ginger Vinaigrette, Shrimp Zoodle Scampi, and Sheet Pan Shrimp and Asparagus! 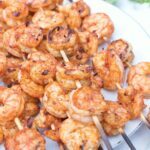 Don’t forget to let me know if you try these spicy grilled shrimp skewers; I love to hear your feedback! Super fast to prepare, super easy to make, and most importantly super tasty and flavorful! 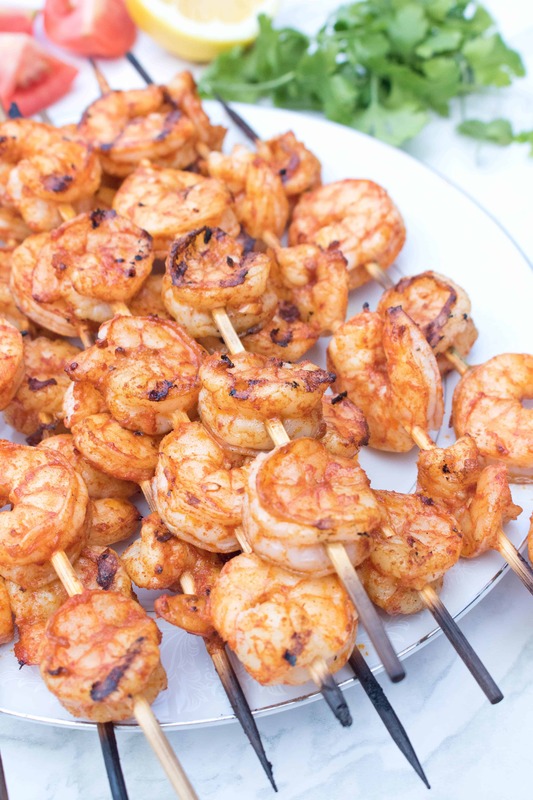 These Spicy Grilled Shrimp Skewers are perfect for your summertime grilling! Serve on top of salads or as a appetizer! Pre-heat an outdoor grill or grill pan on stove top on high. If using wooden skewers, fill sink or dish with water and soak skewers. Add shrimp to a medium sized bowl. In another small bowl, mix all of the other ingredients. Add mixture to shrimp and mix well so all the shrimp is coated. Add shrimp to skewers and grill for 90 seconds on each side. Serve immediately! I love grilled shrimp almost more than anything else during the summer months! (I’ve even pull out our indoor grill during the winter months). This recipe looks perfect. Love the garlic, paprika and lemon combo. Mouth watering. Thanks for the recipe! You had me at 10 minutes! These grilled shrimp skewers are just on time and perfect for summer. I’m looking to switch to a more pescatarian diet. I need recipe like this to get me on my way. I can’t wait to make these! You can never go wrong with a dish like this. We love seafood in our house. These are perfect for entertaining. So easy to make, you can whip these up for dinner any night of the week. Oh, Tracy, you are speaking my language with this one. 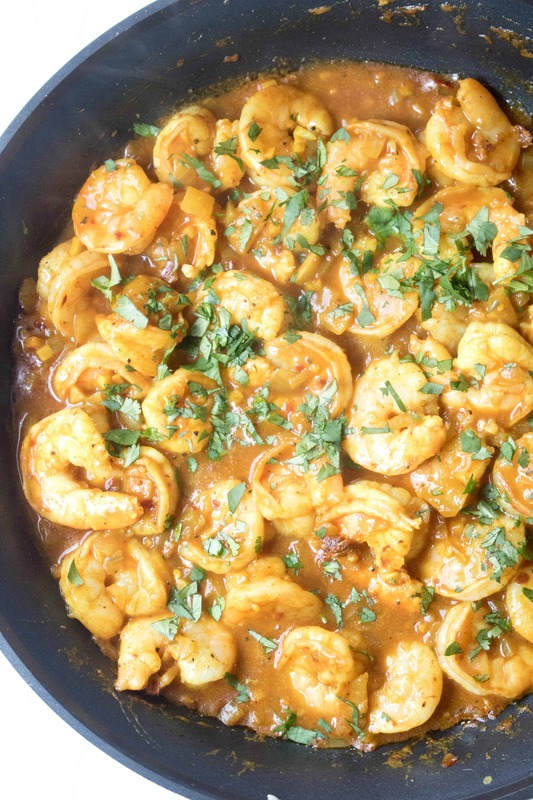 Those shrimp look absolutely delectable — and the flavors you’ve incorporated are spot on! All you need is a side of rice or maybe some grilled veggies to go along with it. Maybe a glass of chilled sauvignon blanc — or two. This meal puts me in my happy place! Well done. I need to make grilled shrimp more often. These look so flavorful and tasty! Great idea to use skewers instead of grilling basket. This is my kind of summer dinner! I’m such a fan of all things shrimp, and there’s nothing better than grilling them when the weather gets warm. I love the spices that you’ve used with these! It sounds like they have the perfect amount of zesty flavor to complement cooking on the grill. I would devour these on top of a salad or for an appetizer! Shrimp are a busy family’s best protein. Not only are they quick to make but they are so tasty. We are lucky, right now we are on the coast and they are bringing in fresh shrimp every day. I really like the spices you added to the shrimp. And grilling is so quick and easy all you need to finish the meal is a veggie and a side. As a lover of all things seafood, I will say that shrimp have a big advantage over pretty much everything else in terms of prep time. I mean, 10 minutes, including prep? My kind of easy. 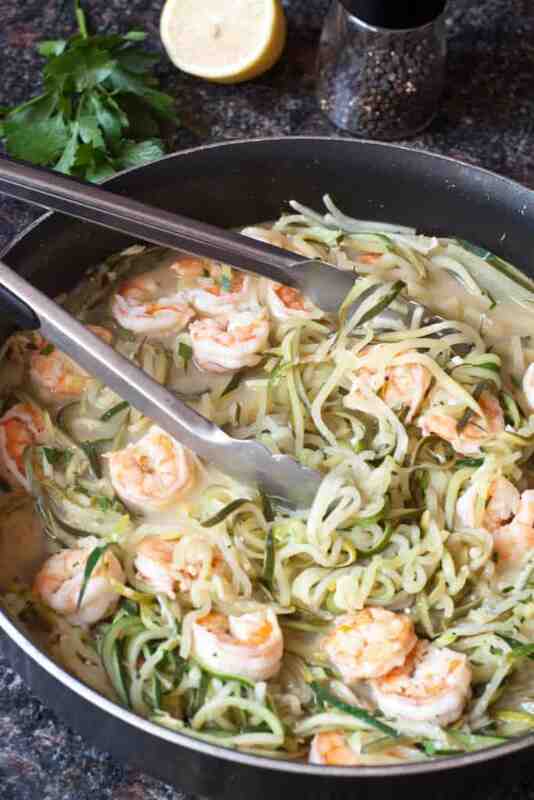 And given how readily my kids gobble up shrimp too, it’s wonderful to have a delicious recipe like this waiting for one of those busy evenings. Case in point: I’m writing this comment from my son’s violin lesson. Lol. 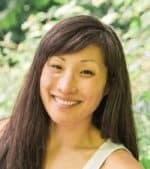 Thanks, and cheers! These shrimp sound so tasty. We actually don’t cook with seafood very often, but this has inspired me. You make it sound so easy and delicious. Thanks for the inspiration. 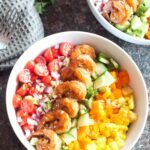 I am all about spicy and have been obsessed with shrimp lately! Definitely firing up the grill and making these skewers soon!! I LOVE grilled shrimp and am so excited it’s grill and al fresco season around here. These grilled shrimp would be awesome on their own or stuffed into a taco shell or salad. I cannot wait to whip up these easy shrimp and enjoy outside with the family! 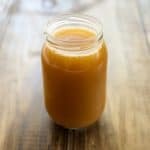 This is perfect for BBQ season! I love a good grilled shrimp recipe once summer hits. I’m always complaining how long it takes for food to be done while BBQ so this will definitely have to go first since it’s only 10 minutes!